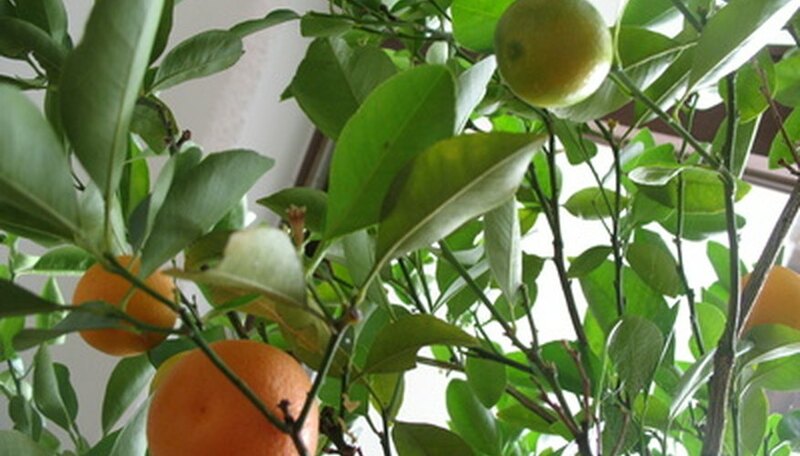 Any citrus tree can be grown in a pot. The Hamlin orange is a favorite because of its early ripening season. The tree produces small oranges that are very sweet and juicy. While trees in pots will not produce as much fruit as trees planted in the ground, growing citrus trees in pots is a great way for those who do not live in warm areas to still experience the taste of homegrown tropical and subtropical fruit. Choose a large planting container that has drainage holes. The pot should be as large as possible, yet it shouldn’t be so large that you are unable to move it with a dolly. Line the bottom of the pot with wire mesh. This will keep the soil from running out the holes when the tree is being watered. Fill the pot halfway full of potting soil. Remove the tree from its container and place it in the pot. Add more potting soil, if needed, to elevate the original soil and tree up to within 1 to 3 inches of the pot’s rim. Continue filling the pot with soil. Water the tree thoroughly. After the water has drained add more soil, if needed, to bring the soil line within 1 to 3 inches of the pot’s rim. Place the pot in full sunlight. Avoid placing your tree in shady areas as this will cause weak growth. Water the tree whenever the top 2 inches of the soil dries out. Fertilize the tree monthly with a balanced tree fertilizer when new growth develops. Follow the dosage recommendations on the manufacturer’s label. Discontinue fertilization when the tree goes dormant. Start monthly fertilizer applications again the following spring. Prune any damaged, dead or unhealthy branches as soon as they are identified. If the tree consistently drops leaves or it produces leggy growth, cut and remove one third of the branches. This will encourage bushier growth. This type of heavy pruning is best done in late winter or very early spring. Move trees into a winter-safe place indoors as soon as frost is expected in your growing region.